It's been a while since I posted anything about 2 Amys, which is totally ridiculous considering how often I eat there. The thing is, I could've done a post about every time I've eaten there, but I would bore the hell out of you, my readers, and we might as well call this the 2 Amys blog. So last Thursday, we were throwing around ideas of where we wanted to go. I called Amy on the way home from work and told her, "I don't feel like cooking tonight so let's go out somewhere - YOU PICK." To which she replied, "What else is new? Anywhere? Even Ethiopian?" "Sure, even Ethiopian", I grunted. When I got home, Amy was out walking Ceiba, and the first thing I asked was where she wanted to go. Surprisingly, she offered two choices - Meskerem or...yep you guessed it, 2 Amys. So obviously we ended up going to 2 Amys, otherwise the title of this post would be Meskerem and not 2 Amys. So we walked the 4 blocks to Macomb Avenue and when we got there, there was a surprisingly short wait. We were seated right away. Our 2 Amys trips lately are defined by the specials menu. This time, there were a few good special appetizers that peaked our interest, including a tomato-and-bread soup and potato and prosciutto croquettes. None of the special pizzas looked interesting to us, so we just ordered the Norcia. We also ordered a couple glasses of wine. I really enjoy the wines at 2 Amys - They're all quality Italian wines. Most bottles run between $20 - 30. The tomato and bread soup was really salty. I think the chef could have laid off the salt a bit. However, it still tasted great. The broth had a ton of olive oil and fresh basil in it which were good things. The potato and prosciutto croquettes were very good. Just the right amount of flavor in a fried appetizer. I really wished I had some marinara or something to dip them in. The norcia pizza was fantastic as usual. I mean, you really can't go wrong with this pizza. Take a great crust and put a little marinara sauce on it. Top it with some fresh mozzarella, roasted yellow and red sweet peppers, and salami (oh and of course, olive oil) and you've got yourself a pretty damn good pizza. Lately, Amy and I have also been ordering the cookie plate which has become a staple on the menu. You get eight cookies including sugar, biscotti, truffles and another kind of cookie that has changed every time we've order it. They've been great every time. I recommend ordering some coffee or cappuccino to go with them. Now I want to talk a little bit about the atmosphere - there is none! I mean seriously people, this is a pizza place. If you want fine dining, you really need to go elsewhere. The dining room can be a bit loud, but I think it's pretty much a problem with the design of the place. The ceiling is an old-fashioned tin ceiling so it echos really bad. Also the service can be a little inconsistant, but is more often good than bad. In the end, the bill usually ends up costing us between $50 - 80 after tip, which is reasonable considering we usually order a nice bottle of wine, appetizers and dessert. Lately, we have been trending in the upper part of that range. Here is my original post on 2 Amys. 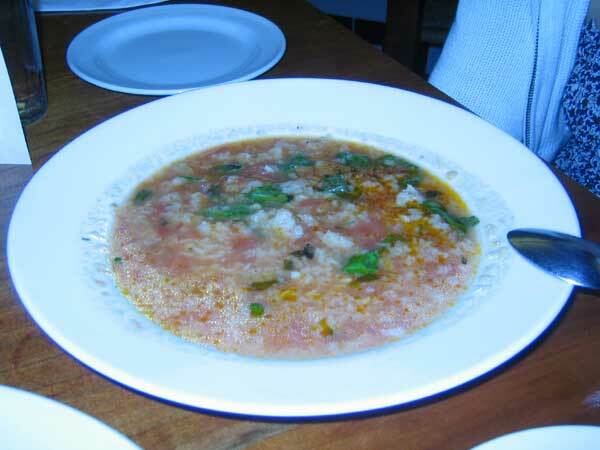 You mentioned that the bread soup was too salty. We too eat at 2 Amys almost weekly and it may be our favorite restaurant in DC, but we find the majority of their pizzas to be too salty. That's partly due to some ingredients (anchovies) but the chef seems to have a heavy hand with the salt shaker. We usually order the Margherita Extra and that is always perfect. hey there... I live about an hour away from D.C. and my boyfriend and I are planning to go there for our 1 year anniversary but we have no clue of any good restaurants around... that are affordable(that's an important part too!)... could you send me a list of choices? Thanks! I keep hearing how great 2 Amys is but I have been there two VERY disappointing times. The wait staff is exactly that, they wait until someone actually has to go and find them to take the order. Then, the REAL waiting starts. Each time there the wine has been nearly hot when first served. My first visit to 2Amys, the waiter suggested that I put ice in it when I said it was really warm. I wouldn't mind that so much in the French Caribbean, where it is commonly done but it is hot there. I can see that he enjoyed things cold like our pizza was served later. After slighting him by only giving him a 15% tip, I felt bad but not that bad. My second visit, after 15 minutes, I went to three waiters each standing by the bar type area and each saying, "That is not my section." However, none of them offered to get our waiter. I started to think, "Is this the allure of this place, bad service and mediocre food?" Well, again I had bad service but this time the food was worse. It was funny because all of the other tables near us were complaining of the same problems. I think it is just a place where hip people want to say they have been. I am glad I know what it is like to have "been there" because I won't get fooled into going there again. Next time I'll go to Pizza Hut in the suburbs. At least people smile there. I must agree with James: the service isn't just indifferent as in most of DC, it's actually bad, sometimes offensively. Rude, slow, snotty. 15% was more of a pat on the back than the 5% they deserve. The pizzas are, in my opinion, average. Not good examples of italian style pizza, and generally not as good as, e.g., the pizzas at Faccia Luna (where you can actually get good service, too -- imagine that). I suppose it's possible that my judgment of the food was tinged by the service, but I am trying to be objective about it, and I was not impressed. We ate at 2Amys last night, and I thought that it was deliciious. We had really nice attentive service that was not annoying. After a wait at 9:30 on a Thursday we were seated and ate a great salad of oranges, chives, red onion, and olive oil and each ate a pizza. Then, the desserts - vanilla bean panna cotta and amazing rhubarb ice cream were wonderful. It was a delightful and delicious dining experience. My husband is usually really sensitive to salt, and he didn't have any trouble with his margherita pizza or anything else we ate. I hope to have as good an experience when we return. I think the reason why DCFoodies and Mrs Foodies like and rave about this place (2 Amys, I have yet to find this place) is that they are regulars. If I go to a restaurant enough, I expect that the servers will remember me, and will always give me better than average service. Though I enjoy DCFoodies reports, I do believe that he does eat at the same restaurant more often than the average "local", and that his reports are skewed a bit. He himself has mentioned that people in restaurants have heard of him. As much as I would like to try 2 Amys, it's not at the top of my list, and I do get tired of reading about their monthly trips. I look at his reports with a grain of salt. His reports are for entertainment value and not something that we should hold him to, just like our own experiences and opinions. Sometimes we get good service, good food and a good experience, sometimes not. Whether 5 star or 1 star... DC restaurants food and service are ALL inconsistent. This is the nature of the business. Once again, I respect DCFoodies efforts and opinions. I've been to some of the restaurants he has mentioned, and they have been outstanding, and I've been to several that were horrible and I will never go back. I do enjoy your website! You don't know what your missing, but I respect your opinion. If you've been burned by some of my other recs, I'd like to hear which ones they were. I try to point out to people when they read my reviews that they should take the date of the review into careful consideration. Cooks, suppliers, and management can all turn over in a matter of weeks at a restaurant, taking it from the upper echelon to the bottom rung. First things first: there isn't any truly great pizza in DC. If you've ever had pizza at Frank Pepe or Modern Apizza in New Haven, Connecticut, you'll know. That said, I like 2 Amys in relation to DC pizza. They do a decent job, though they botch one thing: they drizzle olive oil on the finished product to create an "authentic, greasy sheen" on the pies. This is pointless and, in the process, it causes the pie to prematurely cool. This is a problem with all pizza in DC: the ovens aren't hot enough to begin with, and then the crew doesn't get the pies to the table quickly enough. The result is a rapidly-cooling pie that doesn't fully satisfy. Also: why just one size? There is no law saying that Napolitan pizza needs to be a single size, and the best places in the country offer more than a 12-14" pie. Yet the best places in DC - 2 Amys and Sette Osteria - seem locked into this silly, small-pie-only notion. Does this mean I don't like 2 Amys? Not at all - like I said, it's good for DC. However, it doesn't hold a candle to the best of New York or New Haven. I need to try Radius, in Mt. Pleasant, to see if they finally have something more worthy. 2Amys serves pizzas that are similar to what you would find in Italy (hence their certification by the Neopolitan Pizza Association in Italy, which is part of a movement promoting true local Italian cuisine). The pizzas are one size and the ingredients are extremely fresh. This is the closest thing I've ever had in the US to the pizza I've had in Rome, Naples, or anywhere else in southern Italy. There is absolutely nothing that compares to 2Amys in the Washington area, unfortunately. I have not had bad service there but I understand how frustrating that can be. To me, the quality of the food and the uniqueness of many of the dishes far outweighs any issues related to slow service. To those who mentioned that you can get better pizza in NY, NJ, eastern PA, CT, etc. I see your point but I think you are comparing apples to oranges. As an Italian-American who hails from that region of the country, I really enjoy the pizza that is served in pizzerias in the aforementioned states. 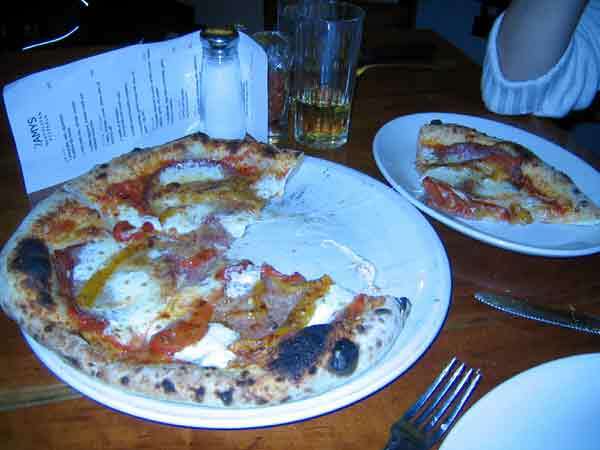 However, that is Italian-American pizza (even though it is referred to as "Neopolitan style" or "Sicilian style"). It is not Italian pizza and you will not find anything like that if you go to Italy. Therefore, I don't think you can compare 2Amys to Italian-American pizza. In my opinion they are two different styles of pizza that are equally good in their own right. However, I do agree that you really can't get good Northeast style Italian-American pizza in the DC metro area. The closest I've seen to good NY/NJ/eastern PA pizza is Valentino's, near Little River Turnpike and 395. If you like chicken on your pizza go to Faccia Luna or Pizzeria Paradiso. Had my first 2 Amy's experience last week.. Great pizza.. No one cut it, though.. I just assumed that's how it came... HA! I recently had 2Amys and was disappointed. The crust was soggy, I couldn't even pick up a slice without everything falling apart. I came here looking for the hours for 2 Amys (found 'em, thanks! ), and thought I'd weigh in. I LOVE 2 Amys. I've only been about 4 times. The Alexandria Faccia Luna tends to be the default pizza place for The Husband and me because it's closer to us and it doesn't have the long wait. We used to go to Pizzeria Paradiso sometimes for a treat, but now that we've discovered 2 Amys, we wonder why we were willing to wait so long to be seated at Paradiso. The pizza at 2 Amys is awesome. It is so much like what I had in Italy this spring, and the toppings are wonderful. My favorite one I ever had was from the specials menu, with fontina and grilled veggies--YUM. I do find some of their appetizers to be a bit heavy on the salt, but I am also very sensitive to salty tastes, and The Husband doesn't think it's an issue at 2 Amys. Sometimes the servers seem a bit harried, but when you see the crowd on a Friday night there, I think it's understandable. They are always friendly, and patient with any questions we have about the menu. I'll be trying 2 Amys out at lunch time this weekend, so I'll see how they are then. So you're saying the wait was short at 2 Amys? I went in there on a friday/saturday, and the wait was horrendus! i was going to wait at the bar, but the bar was overflowing with people. i swear, there was a line of people holding drinks that went through the door. so i just said screw it and went up to faccia luna (i still call it that, even though it's now kavanagh's pizza pub). last i recall (the last time i was able to be seated) the food was pretty good, but it wasn't EXCELLENT. try Faccia Luna (sorry, kavanagh's) on wisconsin across from Guy Mason & fresh fields. very affordable, great service, never a wait (ever), excellent food and a great environment. try it out. 2Amys is excellent pizza. after posting last night i ventured out to 2 amys today and had myself some. it was fantastic. the secret is to go at lunch time, or book ahead. faccia luna and 2 amys are just different types of pizza. they are both great in their own right. We had a great dining experience at 2 Amy's last weekend. I can understand others comments...loud, busy, food on the salty side(which doesn't bother me)...but we loved our meal and Im already dying to go back. I think a big part of the salty-factor is anchovies. I ordered the deviled egg appetizer which comes drizzled with a great pesto sauce. Yum! (but salty due to anchovies.) I then had the puttanesca pizza which featured broccoli rabe (a personal favorite) which was also on the salty side but I eagerly ate every bite, it was so good. Rick made his own pizza with mushrooms, prosciutto, and mozzarella. He was moaning that it was soooooo good! And he is not the pizza lover among us. I think 2 Amy's is like a good movie. If you wait too long, hear too many glowing reviews, your expectations are raised to an unreasonable standard. If you consider it a nice local place to grab a good pie...it over delivers! After reading about 2 Amys here and from Tom from the Post, I finally went and LOVED it. I suggest sharing a pizza with your pal and getting lots of different appetizers, which are really fun. The suggested meatballs were awesome, the potato frittata is fun, and the fig jam on the goat cheese plate made my day. I take (fake) offense to another commenter referring to a 2 Amys pizza as a pie. It is not a pie! "Pies" are in NY and NJ and are the alternative to a "slice" which could be eaten while standing or sitting in a booth. For by the slice, standing/take out I like Alberto's in Dupont Circle. That's two people now that have suggested Alberto's. Looks like I need to try them myself finally. After trying to get into 2Amys for several weeks (not willing to stand around an hour for a pizza) we finally got in. And even after everyone said "It's the BEST pizza". . .I found it to be pretty average, and the service horrible. I'll give that the crust had a nice taste to it, but it didn't stand out. It definitely wasn't worth the wait that people go through to get in this place. I love 2Amys. What I don't understand is why there are so many complaints about the wait becuase there is always a wait! Its the way it is! No one argues that the restaurant is more than it says on the window. Its a pizzaria. Go in. Enjoy yourself. There are kid-friendly options and creative, more "adult" fixtures as well. If you don't like the wait, don't wait. We've always enjoyed ourselves, the food, and the staff. Its not worth getting grumpy over the wait because you will ruin the experience for yourself. I went to 2Amys last week with my wife and a couple of friends after hearing from an Italian that it served the best pizza in DC. First, I must say that disagree with people that say that the pizza is salty or raw. To say the truth, it was the first time I ate real pizza in North America. The pizza was perfect for me. Not too thick, not too thin, with a nice and crispy border, full of blister (the way it should be). My pizza had anchovies and it was as salty as expected considering the amount of anchovies (the way I like it). In relation to the wine, it was also perfect (a Primitivo with a nice body and fruity flavour that could age for a couple of years due to its sweetness). The ambient was a little bit noisy (as most pizza places are in Italy) and the service was a little bit slow (which was not unexpected considering that the place was crowded). Nevertheless, the waiter was extremely friendly and I cannot complain of him. The last surprise of the night was the dessert. Everybody was full but I managed to find some space and ordered "canolis". The canolis where perfect (crispy shells and a wonderful creamy zesty ricotta filling. Ahhh....I almost forgot, the appetizer was also marvelous but I can't remeber its name. All I remember is that it was some kind of fried risotto balls with muzzarella filling. Wonderful! Ah yes. 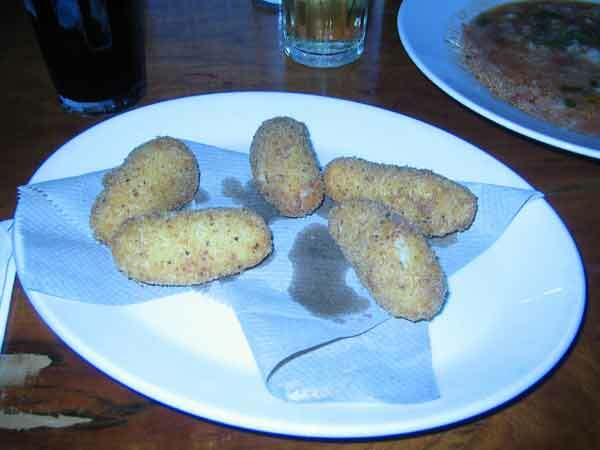 Those would be the supli - also known as arancini. I have eaten at two amys maybe ten or twelve times. Having enjoyed almost every experience, I can tell you this: the staff is always friendliest when you are friendly first. When you arrive, two amys is always busy, and you can expect that if any manager is on duty, they are probably drunk (this is an inside tip from the staff, who are more than happy to dish gossip at every opportunity!). That being said, the wait staff does an amazing job turning tables over and doing diner-style service for wealthy, sometimes snobbish clientele. Though the prices are expensive, the volume of service allows little choice but to subordinate the finer points of service to the overwhelming number of customers. Cut the kids some slack. They are all friendly if you take the time to be polite and show compassion. Congrats on being quoted on the new 2 Amy's website. Had another wonderful lunch at 2Amys on Friday, always a pleasure. However, both my husband and I ordered wine by the glass. We were shocked at the minimal pour we received. I give them the benefit of the doubt that it was four ounces. It looked like and drank like the shortest pour we've ever had at a DC restaurant. Makes us rethink our enthusiasm for 2Amys. Take a gander where they actually define Neapolitan Pizza. It's educational. 2 Amy's is fantastic. Some of the above comments really don't ring true to ANY of the many times I've been to 2 Amy's. Here's a constructive suggestion however: If you think the toppings are too "nouveau" or not the right combination, make your own pie. Start with the 2 Amy's (just marinara and mozzerella) and add toppings. You can easily pick another, more gourmet cheese, an interesting meat, and a vegetable and still come out with a ~ $12 pizza. I have started doing this, and the results have been fantastic. Some of the ingredients you can put on are really good: goat cheese, buffalo mozzerella, salami, pancetta, prosciutto di parma, etc. etc. I have to agree with the people who said that the staff at 2 Amys is rude. I really don't expect to be treated rudely anywhere and there are fast food places that are nicer and friendlier than this place. I hope they're actually looking into why people think their attitude stinks. I'd go back there, but I felt pretty slighted by the service. First of all, Georgette, every word in your post is so completely true. Tell it, sister! One other thing - "authenticity" is nice, but I get tired of asking what things on the menu mean. and i grew up in a heavily Italian-American town in NJ. At least give me a vocab list with the menu! 2 Amys...8 out of 10. The turnip and proscuitto crostini is the best thing I have had though the deviled eggs with green sauce are tasty too. The pizza is pretty good but I think the crust at Sette is way better and the overall product at Sorriso in Cleveland Park is superior. 2 Amy's, in my opinion, has taken a precipitous fall from grace. Pizzas are consistently undercooked. There seems to be no quality control. I end up ordering my pizza well-done, and despite black outer-crust, it is still somewhat soggy at the center. Also, they have one of the worst mixed green salads around. Too much frise' and the dressing seems to be nothing more than a squirt of lemon juice. Comet Ping Pong has surpassed 2 Amys by far. Comet only surpasses 2 Amys if you prefer a crust as crisp as a cracker and overpriced toppings. Otherwise, I challenge anyone to find a better pizza in the city than 2 Amys. I was at 2 Amys tonight and at least once a week for the last month, and they're just as on as they've always been.